Built by Incat in Tasmania and delivered in 2003, the 98m Wave Piercing Catamaran HSV 2 Swift was contracted by Military Sealift Command, Washington, DC from Bollinger / Incat USA, LLC, Lockport, Louisiana for the US Navy. Following successes enjoyed with HSV X1 Joint Venture and TSV 1X Spearhead, High Speed Vessels (HSV) previously acquired through Bollinger/Incat, this third craft was contracted to service operationally as an interim Mine Warfare Command and Support Ship (MCS), and support transformational mine warfare modular payload initiatives. HSV 2 Swift is capable of maintaining an average speed of 35 knots or greater, loaded with 500 short tons, consisting of 350 personnel and military equipment. A minimum operating range of 1100 nautical miles at 35 knots was required by the contract, as was a minimum transit range of 4000 nautical miles at an average speed of 20 knots. Furthermore, she is capable of 24 hour operations at slow speeds (3-10 knots) for experimentation with unmanned autonomous vehicles, and to support dedicated and emerging organic mine warfare missions. A stern ramp capable of on/off loading directly astern or to the starboard quarter is fitted. The ramp is capable of loading/unloading a multitude of military vehicles up to and including M1A1 vehicles up to 26,000 lbs, whilst underway. The crane is capable of lifting up to 22,000 lbs to and from the flight deck. 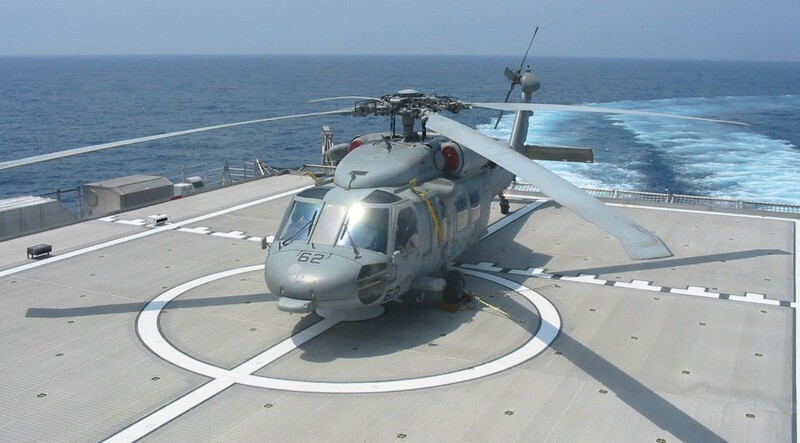 The vessel has a NAVAIR certified helicopter flight deck for operation of MH-60’s, CH-46, UH-1 and AH-1 helicopters. An area protected from the weather for storage and maintenance of two MH-60S is provided to enhance aviation operations in day, night and instrument meteorological conditions. During flight deck certifications, HSV 2 Swift’s crew conducted aircraft recovery while making 43 knots (80km/h) during one recovery and had 66 knots (122km/h) apparent winds during another recovery. In early 2004 HSV 2 Swift participated in West African Training Cruise 04, an exercise designed to enhance security co-operation between the United States and participating West African nations. On 03 January 2005 HSV 2 Swift left her homeport of Naval Station Ingleside, Texas to support Operation Unified Assistance, the humanitarian operation in the wake of the Tsunami that struck South East Asia. During Operation Unified Assistance the crew conducted many firsts for the unique vessel, including 30 straight days at sea, supporting a helicopter detachment and its support crew for 30 days with high tempo flight operations as well as conducting two underway replenishments at sea. In September 2005, HSV 2 Swift further proved its worth during Hurricane Katrina recovery efforts in New Orleans. The vessel ferried precious relief supplies between Naval Air Station Pensacola and ships deployed throughout the Gulf Coast region stabilising areas affected by the hurricane. HSV 2 Swift’s unique design made the high speed vessel an integral part of the mission by enabling the ship access to depths of less than 12 feet. During July 2006 HSV 2 Swift used her speed, capability and manoeuvrability to delivery repair parts and replenishment items from Manama, Bahrain, to Jebel Ali, United Arab Emirates, for supplying USNS Supply (T-AOE 6) in less than 12 hours. “That’s one of the things a vessel like Swift can do – rapid delivery of intra-theater cargo,” said HSV 2 Swift Commanding Officer, Cmdr. Rob Morrison. “Supply received its shipment much faster than usual, using less manpower. Streamlining intra-theater deliveries saves the Navy money, man hours and aircraft wear and tear and that made the 98 metre workhorse very popular in the region”. “With its enormous 28,000 square foot mission deck, the ability to traverse littoral waters, the capability of handling speeds in excess of 40 knots and manoeuvrability that doesn’t require tugboat assistance when arriving or departing the pier, HSV 2 Swift is definitely a multi-tasker”. Immediately following this impressive display of efficiency HSV 2 Swift was called into play during the Israel-Lebanon conflict, being used to transport humanitarian assistance materials from Cyprus to Beirut. HSV 2 Swift has since been deployed to the Far East with detachments from US Navy helicopter squadron HSL-37 Mobile Security Squardron 7, and the Second Platoon of the Third US Marine Corps Fast in support of theatre security co-operation efforts in Philippines, Malaysia and Indonesia. The vessel has been evaluated in risk-mitigation trials in support of the Littoral Combat Ship and JHSV Programs. Sea keeping, structural and propulsion performance were among the qualities evaluated. The vessel also was used to evaluate mission module interfaces for equipment such as the Remote Minehunting System. The Navy has taken advantage of the lessons learned from HSV 1X Joint Venture and TSV X1 Spearhead. The Bollinger / Incat team incorporated more than 75 enhancements in HSV 2 Swift during construction, and demonstrated unusual flexibility and a strong desire to meet the Navy’s needs. It took only ten months from contract award to ship delivery – record time for putting to sea a truly transformational ship. As part of their normal working routine, the three Incat vessels HSV 1X Joint Venture, TSV X1 Spearhead. and HSV 2 Swift have serviced the roughest routes in the world on a year round basis; from 65 degrees North Latitude to 45 degrees South Latitude, including conditions as harsh as the Persian Gulf. To date no other HSV in service has yet matched that ability.